We are all aware of someone who has suffered from fibroids. As a woman who suffered from fibroids for many years, I am very interested in this topic. I understand the plight of women with fibroids and the difficulty in finding solutions for fibroids. Not every woman wants to undergo surgery for Uterine Fibroids. Many are interested in knowing what available treatment options are available in Nigeria. I am happy to talk to Dr. Hammed Ninalowo, a consultant interventional radiologist about non-surgical options for the treatment of fibroids in Nigeria. Here are some questions that I asked Dr. Ninalowo. Fibroid tumors are noncancerous (benign) growths that develop in the muscular wall of the uterus. While fibroids do not always cause symptoms, their size and location can lead to problems for some women, including pain and heavy bleeding. Some women suffer with infertility and pregnancy loss because of fibroids. Fibroids typically improve after menopause because as women enter menopause, the level of the female hormone estrogen; decreases dramatically. However, menopausal women who are taking supplemental estrogen (hormone replacement therapy) may not experience relief of symptoms. Subserosal fibroids, which develop in the outer portion of the uterus and expand outward. They typically do not affect a woman’s menstrual flow, but can become uncomfortable because of their size and the pressure they cause. Sometimes causing pressure various structures for example; kidney tubes (ureters) thereby causing kidney problems. Most fibroids do not cause symptoms and are not treated. When they do cause symptoms, drug therapy often is the first step in the treatment. This might include a prescription for birth-control pills or the use of non-steroidal anti-inflammatory drugs, such as ibuprofen. In many patients, symptoms are controlled with these treatments and no other therapy is required. Some hormone therapies do have side effects and other risks when used long-term so they are generally used temporarily. Fibroids often grow back after therapy is discontinued. The next step is to try more invasive therapy. Myomectomy. Myomectomy is a surgical procedure that removes visible fibroids from the uterine wall. Myomectomy leaves the uterus in place and may, therefore, preserve the woman’s ability to have children. This may be performed by both open or laparoscopic means. Hysterectomy. In a hysterectomy, the uterus is removed completely in an open surgical procedure. This operation is considered major surgery and is performed while the patient is under general anesthesia. It requires three to four days of hospitalization and the average recovery period is about six weeks. If a woman does not want surgery, what are her options? 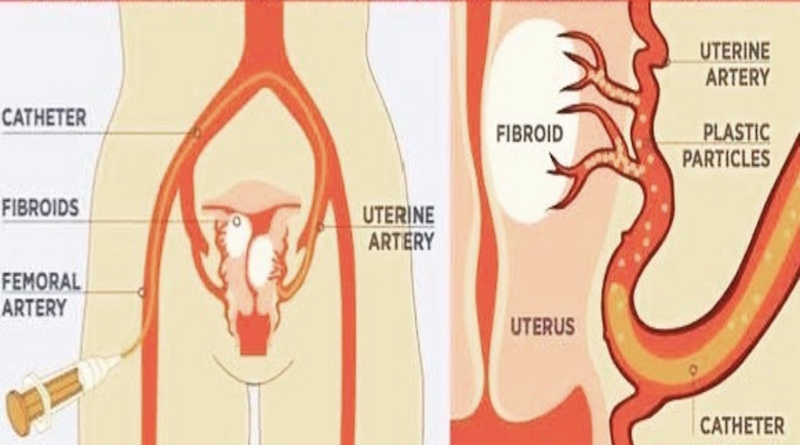 Uterine artery (or fibroid) Embolization (UFE), also called UAE: it is a minimally invasive procedure, which means it requires a small cut in the skin through which the catheter is threaded into the vessel. It is performed while the patient is conscious but sedated (drowsy and feeling no pain). Fibroid embolization is performed by an interventional radiologist, a physician who is specially trained to perform this and other minimally invasive procedures. The interventional radiologist makes a small nick in the skin in the groin or wrist and inserts a catheter into an artery. The catheter is guided through the artery to the uterus while the interventional radiologist guides the progress of the procedure using a moving X-ray (fluoroscopy). Once placement of the catheter into the uterine artery is confirmed, embolic material (small spheres) are injected through the catheter into the blood vessels feeding the fibroids depriving them of oxygen. The lack of oxygen for the fibroid causes the fibroid to shrink and in most times completely disappear. The artery on the other side of the uterus is then treated. The entire procedure is typically completed in less than an hour. I hear UFE/UAE can be painful. How is the pain managed? If hospital admission is required for pain control, where will the patient be managed? Fibroid embolization typically requires a hospital stay of one night. Pain-killing medications are typically prescribed following the procedure. Most women experience pain immediately after the procedure that is similar to a bad menstrual cramping and pain. The pain is worse a few hours after the procedure with most women recover fully within 12 hours. For this reason, we have done a lot of research into the best medication regimens to control pain both intravenously and by mouth with most patients being satisfied with pain control post-op. 99% of women are discharged home in less than 24 hours with their pain controlled. Many women resume light activities in a few days and the majority of women are able to return to normal activities within one week. What are the side effects of UFE/UAE? Can a woman trying to conceive (get pregnant), do so after UFE/UAE? Recent research shows that uterine fibroids do not have a significant impact on fertility, while the removal of the uterus (hysterectomy) makes fertility impossible. Many women diagnosed with fibroids are under the age of 44, meaning they can and may still want to have children. For many of these women, maintaining the ability to have children will be among the most important factors in choosing treatment. Because the uterus remains intact with UFE/UAE, many women maintain the ability to have children, although it is not guaranteed. One study found that half of women under the age of 40 who desired pregnancy after UFE/UAE treatment had successful, full-term pregnancies. Additionally, researchers in this study noted that the course of these pregnancies was largely normal. In another analysis, researchers reported that the pregnancy rate of UFE/UAE patients who averaged 36 years of age was about 60 percent, which is comparable to pregnancy rates in the general population, adjusting for age. Women who wish to maintain the option of having children should discuss the risks and benefits of hysterectomy, myomectomy and UFE/UAE with their Doctor. Can the fibroids grow after UFE/UAE? What are the long term effects of UFE/UAE? Women who elect UFE/UAE or myomectomy should know that there is a possibility that fibroids may return. If the UFE/UAE treatment is successful and destroys the existing fibroids, there is a chance that new fibroids may grow in the future. There is a similar rate of recurrence in women who have surgical removal of their fibroids through myomectomy. The likelihood of needing additional treatment increases for women who have a history of smoking, are African, or have a body mass index greater than 25. For women who have undergone UFE/UAE, the second uterine fibroid treatment can be another UFE/UAE, and they are not necessarily limited in their treatment options. While some women eventually must be treated again, the minimally invasive nature of the treatment, and the fact that they do not have to have their uterus removed outweigh the negatives for many women. In fact, women who chose UFE/UAE and needed a second treatment later reported that they were still very satisfied with their choice five years later—a satisfaction rate similar to women who had hysterectomies and did not require additional treatments.